Did you look for shooting info back then? Archery form has been well discussed for hundreds of years. Whole books were devoted to the subject. 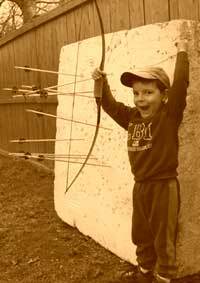 Go to the Archery Library online and check out some of the old stuff. I've been shooting actually longer than badgerman and the only thing I had, in the beginning, was a book on archery that had Howard Hill and Bob Markworth on the cover. I went with that until the mid 60s and met some guys who shot field archery and that began my real formal education on the proper form and way to shoot a bow. I think we all have our own individual form but as long as we adhere to a few basic guidelines we can get it done well. the key is consistency. I remember in the early and mid 60s when everyone started shooting together more around this area, word had it all you needed was a bow sight, but that bow with a bow sight required consistent form. I went whole hog and got target rigs and emulated the best I could find. It was fun being able to hit well at long shots on the old four foot Saunders targets. My hunting style required more versatility, this is pheasant country. Fast shooting still has all of its own form refinements, it just happens faster. Not all shooting methods work for all people and in all situations. Well it couldn't have been like that everywhere because the material has been pretty consistently available so some must have been using it. To be sure, the information was there but we didn't know it and unless there was some sort of "instruction" on the bow box, it wasn't readily available, IMO. I grew up in a VERY small town in South Dakota and the ONLY book available in the town's Carnegie library was "Hunting the Hard Way." I read it many times!!! BUT even if I had known there were published magazines (or other works) about archery, I couldn't afford them and I saved my quarter weekly allowance to buy a hardware store arrow. That had to last me all summer. In the late 50s and early 60s we were (I think) much more "do it your selfers". And frankly I never even thought about that kind of information. Today with the "net" there is an availability of information that would have totally astounded us back then. In high school and college much more information was available but typically, I was out "doing" rather than sitting in a library looking for information I didn't even know was out there. Yes, Boy Scout camp really taught me a lot but I was the teacher not the student camper in those days. I think it was just a VERY different era with different attitudes and expectations. I do think that folks generally don't go looking for something unless they know it exists. But the internet has changed that. Now, if we can think of a question, it pretty much is a "Google" away. I built all my own stuff from the beginning and it was all from Library sourced info. There is a surprising amount of stuff lurking in them. The book by Edmund Burke stands out in my mind. The books by ET Seton are a gold mine of info on Archery buried within great stories. This was a good 40 years ago when I was set on the path. Depends on where you were as well. My dad was an indoor target guy when I was growing up. So, he was very big into "proper" form. He was also an avid bowhunter. As far as being able to find written material on archery, our local library at the high school had a limited supply of archery writings, and they were able to borrow for your use nearly any publication avaialble. Including monthly magazines. So, it was avaialble, just in print rather than in digital format. I agree also that there have been MANY good threads related to "proper" form. And, they have been beneficial to many. But that being said, there isn't 1 type of "proper" form. Bows have been shot in many different ways, for eons. What we consider to be "proper" these days really isn't much different from what Roger Ascham and Horace Ford were teaching many, many years ago. The "form" that most adopt is MUCH more closely related to European recreational archery than any type of aboriginal archery. And that's fine, but let's not be so bold as to assume that the way that is the most popular, is the only way that it can be done, and done well. The "proper" form that Ishi used for his purposes was vastly different from that of Chief Compton, Saxton Pope, and Art Young. But, he and his people fed themselves, and defended themselves for a long time using that form. The form used by Plains indians is vastly different from what is popular today, but again, it served them quite well. Howard Hill's "proper" form isn't considered "proper" by most today, but it sure worked for him. There are certain steps that can be incorported that MAY make it easier, but the most important aspect of a shootng sequence, and "proper" form whatever that is for you, s that you are able to do it as close to the exact same way on every shot as possible. To some extent, there is a semi movement to try and fit every archer into i mold, (and there are PLENTY of heated discussions and arguments on here that prove that very thing) and that doens't always work. Archers have to decide what THEY want from archery, and then adapt to a consistent, repeatable sequence and style that will allow them to reach their own goals, not those of someone else. Fred Anderson said that no one person has the best way of shooting, an archer should find a style that fits THEIR body and stick with it. One of the BIGGEST mistakes that arches make is that they think, and are in some ways lead to beleive that they have to shoot like someone else. Thay don't. Not arguing Elderly but I do think it WAS different 60 years ago. As I said, there was ONLY ONE archery book in our entire library. YES the info was out there at least in some places but rural America where I lived didn't have it. fdp I am agreeing with 99.999% of your points, I don't believe in "doing it this way you will be great", I believe in "if you are doing this way you may find your way and be great". One single thing has to be clarified and I think it was the initial idea of this topic. All the examples enumerated by you have/had a pass-down-hands-on-knowlegde of what was working. When you don't have this knowledge and you are starting your own trial-error learning you will not become good in your life time - maybe decent if you are a very intelligent one. Knowledge was the most important thing in old times and it is the same today. The Internet really helped and the world is a Global Village : all the info needed is a click away. "There also was a certain stubborn bravado to the average Trad Archer. Most couldn’t be instructed because it was a mortal sin to hold, Aim, & consistently hit something. Coaching is no longer frowned upon & the internet is also a great resource. Archers are also eager to learn to shoot properly & want Repeatable accuracy"
Liquid Tension, I agree, attitudes have changed over the last 10+ years. Our Archery club has around 40 qualified Coach's, we encourage members to do Coaching courses as it also helps them develop into better Archers and the novices are getting consistent and uniform advice from the experienced Archers. The World Indoors a couple of years ago our club members picked up 18 medals so is obvioulsy beneficial. Guys.. nothing but appreciation for your help BUT. I see an attitude coming from those who say they want to help.. I'm not sure exactly.. but the way it comes off is pushing a lot of people away and certainly does no good.. I'm not trying to make anyone mad, although I'm sure it will and for that I apologize..
Keep in mind that the coaching crowd needs to get a handle on unsolicited advice on the range. You take one shot Asian style and nine form guys burst from the trees and try to force you to shoot the "right" way. after all?...it's the only one they know while we archers are a very diverse group. LT, they are out there. Many on here have mentioned it. You do sound a little bitter about those days. Let it go. I grip and rip. It's worked just fine. The problem is either campp getting too forcegful in their beliefs, however that is expressed. I've run into some of those folks that Elderly mentions over the years, Not a lot of them, but some. Not everybody is cut out to be a coach. Regardless of how much kowledge they actually have. Most of the annoying folks that I have run in to wereindividuals who were fair shots, probably the best in their little group, so they immediatley think that anyone who doesn't shoot like them, is doing some thing wrong. Only problem is, they REALLY don't know enough about what they are seeing to know for sure. I'm not sure that there was ever that much anti cioaching out there. "Traditional" archery when it started making it's come back was mostly dominated for wuite some tim by the writings of Fred Asbell. And eventhough I like him, he did/does promote what could be considered a "grip and rip it" style. Most of the folks who began shooting recurves and longbows during that time had no exposure to any other kind of shooting. That being the case, that was the method that was thought to be"proper". Then add to that the Howard Hill craze that ran rampnat a few years after that. Everybody thought (and many still do) that Howard Hill and John Schulz don't have a shooting sequence, Which is dead wrong. Now there is a lot more exposure to shooting a bow using other styles and methods. That makes people more receptive to "new" ideas and ways of doing things. Ok we run our own Olympic-Field and 3D Archery School, the people coming know what we do and how we teach (we tell them before they join), if they want to shoot like Lars Andersen, Katniss Everdeen etc we tell them "This isn't the place for you" and if at all possible, send them to the right place. Those that join do the basic instruction and after they have the basics of safety and Form they can do what they want, we don't force them, after that initial instruction they would need to request more training to develop. Some of the kids are just sent by Parents for an after School activity and really not interested in developing any more. we're fine with that as long as the don't distract those that do. Don't think I've ever walked up to anyone at a tourney or our School and told them that I can get them shooting better, it's just going to embarrass or offend them and they will say "No". Anyone who approaches me for help I will always be willing to help but they have to come to me.